This villa has a great open floor plan and sits on picturesque Cayman Kai. The high ceilings, minimal design, and walls of glass windows bring the sea in, and the deck has several places to lounge and relax. The pool seems to blend with the sea because its so close to the beach, and there’s amazing snorkeling in coral reefs just a few steps away. If you want more action, head up to Rum Point for water sports and restaurants. Your family will love staying in this spacious villa. Excellent snorkeling off small beach! 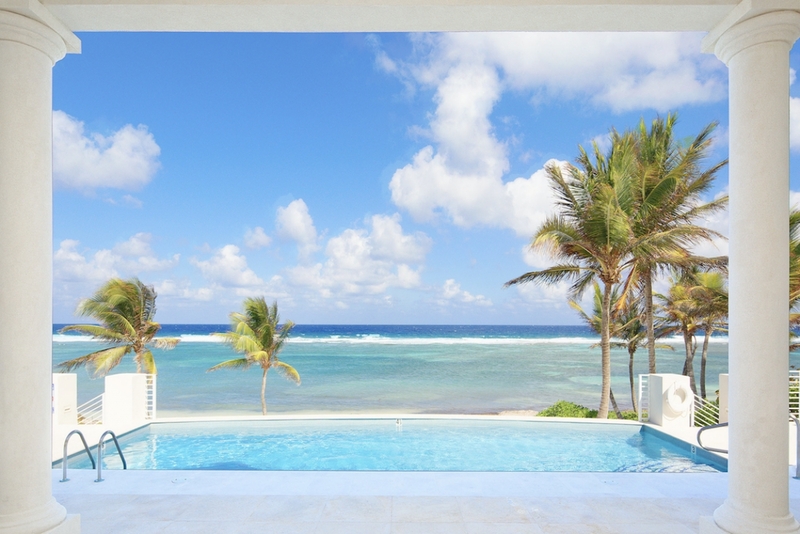 Ocean Kai is an air-conditioned beachfront villa on Cayman Kai, just steps from coral reefs perfect for snorkeling. Water shoes are recommended to protect the marine life. The large, private pool faces the sea, and stretches the length of the villa so guests can swim laps. Loungers sit on either side of the pool, perfect for sunbathing and relaxing. The sandy beach below leads to snorkeling in the reef, and the covered veranda has sofas and dining so guests can relax in the shade. The covered veranda has access to the living and dining area, which has a minimalist, open design and cathedral ceilings. The living room is cozy, the perfect place to gather for a movie at the end of the day. The dining table sits in the middle of the oversized space, and the gourmet kitchen sits on the opposite side of the living room. Cooking in the huge kitchen is a breeze thanks to its stainless steel appliances and tons of open space. There are tons of windows throughout, which brings the sea into every space. Each of the five bedrooms feel private, as they are spread out around the main area and have solid doors that are nearly soundproof. Four of the bedrooms have TVs, and each bedroom has an ensuite bathroom. The three king bedrooms each have french doors leading to the pool deck and ensuite bathrooms with a separate bath and shower. The last two bedrooms would be great for children since they don’t have exterior access. One has a queen-sized sleigh bed and the other has two twin beds. Kids will love the loft upstairs, which has couches for lounging on and a window seat with a wide-sweeping ocean view. Children can have movie marathons on the entertainment system with a flat screen TV while adults watch TV or enjoy drinks downstairs. Ocean Kai is near Rum Point, but far enough to provide a peaceful getaway. With the beach in the backyard and snorkeling nearby, this villa rental would be ideal for a family vacation. Small beachfront with excellent snorkeling. Watershoes recommended. We had three couples that stayed at Ocean Kai and we were all amazed at the beauty of not only the ocean, but the villa as well. It was BREATHTAKING to wake up in the morning and experience the outdoor patio, pool and views. We also loved that we seemed to be secluded from the rest of the world and had our own private beach and ocean. It was nice to know that Rum Point was only a mile away if we needed a little action during the day, and plenty of restaurant options as well. The villa was beautiful and very well kept. They have everything that you need… and the kitchen was amazing!!! We would definitely come back to Ocean Kai.